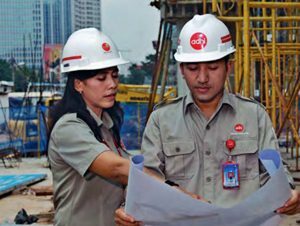 PT Adhi Karya (Persero) Tbk - Adhi Karya or referred to as "ADHI" is a well-known state-owned company in Indonesia, running business in general construction industry. Headquartered in Jakarta. ADHI has main business focus on 5 business pillars; construction, energy, property, industry, and investment. ADHI is public-listed company and is majority owned by the Government of Indonesia. ADHI's shares are traded on the Indonesia Stock Exchange (IDX) under reference code "ADHI". At present, ADHI is 51% owned by the Government of Indonesia (51%) and 49% by public. ADHI now has 6 departments and 6 construction divisions. ADHI's departments comprise of Department of Infratructure I, Department of Infratructure II, Department of Building, Department of Light Rail Transit (LRT), Department of Transit Oriented Development (TOD) and Hotel, Department of Engineering, Procurement, and Construction (EPC). ADHI's construction divisions comprise of Construction Division I Medan, Construction Division II Palembang, Construction Division III Jakarta, Construction Division IV Surabaya, Construction Division V Balikpapan, Construction Division VI Makassar. According to information found in PT Adhi Karya (Persero) Tbk Annual Report 2016 as cited by JobsCDC.com, ADHI succeeded in posting positive financial performance in 2016. ADHI managed to record total revenues of Rp 11,063.94 billion in 2016. This reflected an 17.83% increase from Rp 9,389.57 billion in 2015. Total assets grew by 19.89% from the previous year, from Rp 16,761.06 billion in 2015 to Rp 20,09543 billion in 2016. Minimum Diploma or Bachelor holder (D3/S1) in Taxation, Accounting. Required experience for minimum 2 years in the related field, preferably as staff specialized in Finance - Audit/Taxation or equivalent. Previous experience in tax consulting firm is preferred. Possess certification in Tax Brevet A/B. Operating knowledge of accounting software (MYOB, Zahir, Accurate, SAP). Skilled in using Microsoft Office and Excel. Good communication and administration skill. Have a pleasant personality, able to work quickly and attention to detail. JobsCDC.com now available on android device. Download now on Google Play here. Please be aware of recruitment fraud. The entire stage of this selection process is free of charge. PT Adhi Karya (Persero) Tbk - D3, S1 Tax Staff Adhi Karya June 2018 will never ask for fees or upfront payments for any purposes during the recruitment process such as transportation and accommodation.